Larson 1 Drawer Side Table. 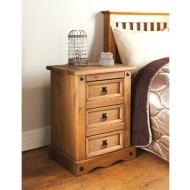 Perfect for your home, this 1 Drawer Side Table provides excellent storage. Store items in the drawer and books, ornaments or magazines on the shelf underneath.